💡 Tip Series: This post is a quick practical guide on how to create your online campus, build your first course, and deliver your first live class online. There are many good reasons to start offering online courses such as greater flexibility, extended reach, and reduced cost. This post is not going to focus on the reasons to create an online course. Instead, we’re going to focus on the steps to take once you have determined that it’s time to start offering your courses online. If you are not yet convinced that offering your courses online makes sense for you. That’s alright. This post will show you how easily you can get started so when you decide to make the leap, you’ll be ready. Once you have created your newrow_ smart account, a great way to get the ball moving is to customize the look & feel of the platform with your branding. I know this isn’t necessarily the most critical step in creating online courses, but I feel that customizing the platform with my own branding was a great motivator for me to press on so I encourage you to do so as well. Once set, those accessing your courses will be doing so through your branding. They will see your company logo in their course directory along with your branding colors. When they access your live classes, they will see your logo as the virtual classroom initializes. This helps build upon your learners’ impressions of your company and helps your learners understand where they are and who is providing them their courses. When you first enter your course directory you’ll find that a course was automatically created for you. You can edit that course as needed or create a new course. A newrow_ smart course encompasses both the self-paced (on-demand) course as well as a virtual classroom specific to the course. To create your course, simply click the + Add new course button to display the Create course pop-up. There you can upload a course image, enter a course name, select a course plan, and write a brief summary to describe it. Once you have entered in the basic course information, click the Createbutton. That’s it! You have created an online course. I recently wrote a blog post about how self paced courses enhance your live classes. I like to use self-paced courses to prep my participants for the class so that the live class is dedicated to a rich dialogue between myself and the learners instead of a one-to-many lecture. Additionally, I typically record my classes. When the class is done, I add the recording of the class to the relevant chapter so that participants can come back and review the class recording on their own time. I look at a self paced course chapter as a lesson or topic. Under each chapter I then add relevant files such as videos and presentations that I shared in the live class or course content that expands upon the topics we covered. My learners are then able to come back to this course to review the various material on their own time. To create a self paced course chapter, click the + Add new chapter button and enter in the name of the chapter. Under each chapter is an + Add new file button. Click the + Add new file button to launch the course content file browser. You can either select files you previously uploaded to your course or upload new files from your computer. The most popular type of content to add to course chapters are videos, but I also share presentations and PDF’s. Utilize the live class for instructor led training. In the virtual classroom you can engage your learners with tools such as screen share, interactive whiteboard, and polls. Every learner joining your live class can activate their webcams and microphones so that everyone can interact with one another via video chat and text chat. Upload course content — Upload files and organize them into folders so that your course content is accessible to you no matter the computer you are using. You do not need to enter the virtual classroom to upload course content as you can upload course content within campus files, but we’ll do it now so that we can prepare the playlist. Prepare your playlist — Course content is the home of all of your course content spanning multiple lessons. Organize for the upcoming class by adding the upcoming items in the playlist. You can add presentations, videos, PDF’s, YouTube videos and more then organize them with drag & drop functionality. Get the newrow_ screen share Google Chrome extension — To share your screen with your participants, you will need to use the Google Chrome web browser and add the newrow_ screen share extension. You can do this on the fly during a live class, but it’s best to get the extension before the class. I utilize screen sharing in all of my classes. 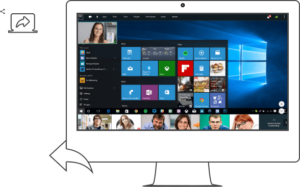 I am able to perform step-by-step walkthroughs of advanced applications without leaving the virtual classroom. Set class mode — In the virtual classroom settings you can choose the class mode you prefer: Virtual Classroom or Webinar. With Virtual Classroom, participants are prompted to turn on their webcam and microphone and once they do so they are automatically added to stage. With Webinar, participants are not prompted to turn on their devices. If they do turn on their devices, then they are not automatically added to stage. Once you have created your branded campus, built your structured self paced course and prepared for your live class, it’s time to add your students and additional instructors. It’s important to note that you do not need to register students in order for them to join your live class. You can simply share a web link for them to join as a guest. Sending a direct link to the class makes the most sense for one-off sessions such as consultations, support and interviews. I prefer sending a direct link for a live class when I am running a one time demo, but I prefer adding users to my campus when the class is recurring. Registering students, instructors and admins in the administrative portal is more convenient when users take multiple courses. Additionally, by registering users you can set their role ahead of time. This is important especially for your instructors and admins. By registering instructors, they are able to access the course ahead of time to build out the self paced courses as well as prepare for the live classes. After inviting students, instructors and admins to your campus, they receive an email confirming that they have been added to your campus. Once they sign in, they will see the active courses they are registered to within their course directory under your company branding. This is where we get face-to-face with our learners. For me personally, live class discussions are THE critical component to an education. Enabling meaningful interaction between the instructor and learners in a collaborative learning environment is awesome. You will see the names of your students that have joined the class in the participant list. If they turn on their webcam and you have the virtual classroom mode set, then they will automatically be added to the stage. If not, then you can engage the students in text chat. Record your class — Recording your class and adding the class recording to the self paced course is a great way to provide your students additional learning opportunities. newrow_ cloud recording provides a standard mp4 video file that you can distribute either through the self paced course, in the live class itself, or download it and share wherever. 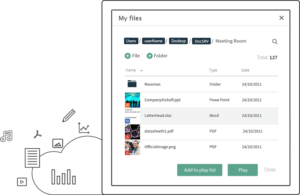 Share files — To synchronously share your files, simply select the files that you added to the playlist. Playing a video plays the video for everyone in the class. Sharing a presentation displays the presentation to everyone. As you change slides, the slides change for everyone. If you annotate slides, then everyone sees the annotations. Presenter position —Utilize the presentation position to give speakers a more pronounced placement. The presenter is simply a position that displays the participant floating over the content or a full screen view if no content is shared. Manage your participants — Not only can you use the participant list to see who has joined, but you can manage those that have joined through the participant list: remove or add them to stage, mute their webcam and/or microphone, or set them as moderators (moderators are like temporary instructors). You can always add new chapters and update files in your self paced course. After each class, you can add the class recording or any files that learners requested to the applicable chapters. You’ll also want to go back to the virtual classroom and update your playlist for the next live class. With newrow_ smart courses, you are creating a full cycle learning program by enabling course prep with the self paced course, instructor and learner interaction in the live virtual classrooms, and follow-up and review after the class.